As part of the UCSC Genome Bioinformatics Group, computer science graduate student Krishna Roskin collaborates with leading genome researchers at UCSC and at top research centers around the world. But that's not a new experience for Roskin, who was involved in a similar international collaboration as a UCSC undergraduate. In 2001, when Roskin was a junior majoring in computer science and mathematics, he got an e-mail from David Haussler, a Howard Hughes Medical Institute investigator and director of UCSC's Center for Biomolecular Science and Engineering (CBSE). Haussler wanted to know if Roskin would be interested in working on one of the most important scientific projects of our time--the exploration of the human genome. Roskin, of course, said yes. Working on a faculty research project is often the highlight of a student's undergraduate experience, and that was certainly the case for Roskin. In fact, he decided to stay at UCSC for graduate school because he was already so deeply involved in Haussler's research program. "It's a great group of people to work with, and I get to work on big, exciting projects," Roskin said. Under Haussler's leadership, UCSC bioinformatics experts are involved in an international effort to understand the human genome--our genetic code--by analyzing its DNA sequence and comparing it with the genomes of other organisms. Roskin's work as an undergraduate led to some important scientific findings, Haussler said. "He's already got his name on several publications, and he's done very exciting work," Haussler said. Initially, Roskin contributed to the UCSC Genome Browser, a web-based tool for exploring the genome that is used by researchers throughout the world. Later, he worked on a comparative analysis of the mouse genome and the human genome. Now, as a graduate student, he is involved in a similar analysis of the rat genome. By comparing the human genome with the genomes of other organisms, researchers can identify regions of similarity and difference, yielding new insights into human genetics and evolution. When the initial analysis of the mouse genome was published in the prestigious scientific journal Nature in 2002, Roskin's name was included in the long list of contributors, along with 11 others from UCSC. "I guess you could say that my senior thesis research was published in Nature, which is pretty cool," Roskin said. According to Haussler, Roskin's contributions led to one of the most significant and talked-about results in that paper. A key indication of the biological importance of a stretch of DNA sequence is the degree to which it has changed over long periods of evolutionary time. Comparing the genomes of species such as mice and humans, which are separated from their last common ancestor by some 75 million years of evolution, can reveal DNA sequences that have been conserved because they play an important role in basic biological processes. "We were very interested in finding out how much of the human genome is still very similar to the mouse genome, suggesting that it is being conserved through natural selection," Haussler said. Roskin's analysis indicated that about 5 percent of the genome contains sections of DNA that are conserved between human and mouse. "This has become a much-quoted number, and there are now debates about it in the scientific literature, with some arguing it is too high or too low," Haussler said. "To have an undergraduate contribute so substantially to a very hot topic in science is pretty stunning." It is all the more interesting considering Roskin's unconventional precollege education. His parents lived off and on in Mexico and traveled extensively through Central America and Europe during his childhood. Roskin didn't attend school, but to say he was home-schooled would be inaccurate, said his father, Lee Roskin. "The one time when we tried to piece together a program, he rebelled. He didn't want to be formally schooled, so it was mostly informal learning from traveling and having experiences and talking to us," Lee Roskin said. When Krishna was six years old, the family got an Amiga computer and he got interested in computer games. By the time he was in his early teens, Roskin was teaching himself computer programming. Later, he attended an alternative high school in New Mexico, and after he graduated the family moved to Santa Cruz. Roskin enrolled as a freshman at Cabrillo College, and before long he was tutoring other students in mathematics and computer science. He transferred to UCSC as a sophomore and soon began to stand out as a talented student. He won a coveted Barry M. Goldwater Scholarship, and by the time he graduated in 2002, with a B.S. in computer science and a B.A. in mathematics (both with highest honors), Roskin had racked up an impressive array of awards, including the Dean's Award, the Chancellor's Award, and the Huffman Prize. Roskin also won two graduate fellowships, although he could only accept one of them, a Howard Hughes Medical Institute Fellowship in the Biological Sciences. "It just shows that you can come from an unconventional educational background and be very successful in an academic setting," Haussler said. Haussler's bioinformatics team is a hardworking group, known for putting in long hours to meet important deadlines. Roskin fit right in. "I remember working on the mouse genome and sending out e-mail at around midnight. I got responses right away from David [Haussler] and even from our collaborator at Penn State, where it would have been three in the morning," Roskin recalled. At the same time, Haussler's group manages to maintain a relaxed and friendly atmosphere. "It's a good environment, and I really like the people," he said. Roskin's current interest in the human genome focuses not on the genes themselves, but on the so-called noncoding sequences. The genes--stretches of DNA that code for specific proteins--actually account for only a tiny percentage of the total DNA sequence in the genome. The noncoding regions are thought to include sequences that perform other important functions, such as regulating the activity of genes. "Finding the conserved noncoding regions is something that everyone in comparative genomics wants to do. The hope is that with more species to compare, we will be able to do a better analysis to identify the regions that are functionally important," Roskin said. The potential implications of this work for human health and medicine include a greater understanding of human diseases, new diagnostic tools, and better treatments. Roskin said he enjoys the work he's doing, and being able to apply his skills in a high-profile project that could have big payoffs for human health just adds to the satisfaction he gets from it. 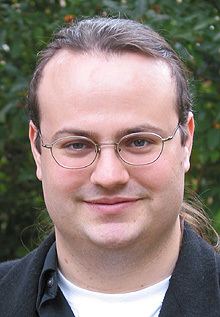 He has been concentrating on biology courses to broaden his interdisciplinary background, but he's still deciding whether to pursue a Ph.D. in bioinformatics or computer science. "The biology is really interesting, but at heart I'm still a computer science and mathematics person," Roskin said.